This week we have completed a full update of AV equipment in room 102 building L22 at London Road. The Institute of Education have specific requirements for the use of interactive screens in their teaching rooms. The use of Large Interactive screens allow students studying to become teachers to work in a way that closely resembles school classrooms. Room 102 now has the following equipment. Standard teaching lectern which includes, PC with interactive touch monitor, Document camera, VGA, HDMI, Audio jack plug-ins and 84″ interactive monitor. If you are due to use the room, please let us know if you have any feedback. The AV team have recently completed new AV installations in two centrally bookable Edith Morley teaching rooms. Rooms 141 and 257 have received a full replacement of AV equipment and now have the following specifications. 141 – Standard teaching lectern with Crestron control panel, PC with Interactive touch monitor, Document camera, VGA, HDMI, Audio jack plug-ins and laser projection. 257 – As above but the room suited a 75″ flat panel LED screen rather than the laser projector. Please use the rooms, we are always looking for feedback on our installations. The AV team have recently completed a new classroom installation in Foxhill House 104. 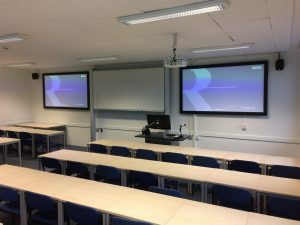 Room users will now be able to use the 75″ high definition flat panel screen to display content from the desk PC or choose HDMI or VGA connection for their own device. Control of the AV equipment has been simplified by using our standard Crestron control panel, consistent with all centrally bookable teaching rooms. We hope that all users of the equipment find the installation greatly improves the teaching and learning experience in this room, any feedback is welcomed to help us understand room requirements.